An oscillating multi-tool can be one of the most versatile tools that you have in your workshop. With the right oscillating tool accessories, you can cut a wide range of different materials, and use the tool for many different purposes. You can do a lot of work with the Sonicrafter F80 4.2 Amp Oscillating Multi-Tool and a good set of oscillating tool blades. With that said, you should try to do what you can to make sure the blades and accessories last longer. You spent good money on your oscillating saw blades, so it only makes sense to get as much use out of them as you can. Of course, buying high quality blades for an oscillating tool is one way to ensure that they will have a long life, but there are steps you can take to make sure your oscillating blades last. In this post, we are going to look at operating an oscillating tool correctly so the blades don’t wear, picking the right oscillating saw blade for the job, and keeping your oscillating multi-tool blades sharp. 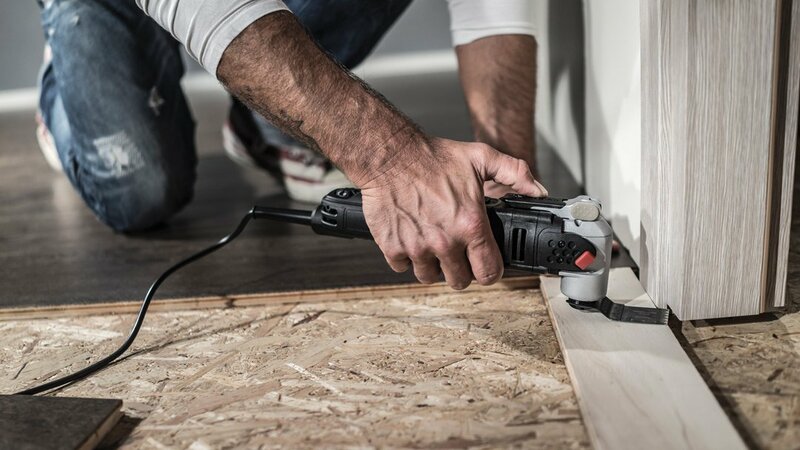 With its versatile design, you can use your oscillating tool for a lot of different jobs. It can be great for cutting the ends off copper pipe, cutting holes in drywall and, trimming doors. With an oscillating tool accessory like a semicircle diamond grit oscillating saw blade, it’s ideal for things like removing grout and cutting materials such as concrete and ceramic. While this versatility is part of what makes an oscillating multi-tool so attractive, every job requires different techniques. If you are using the tool incorrectly, it can cause unnecessary wear on the blade. Make sure to study oscillating tool tips to learn how to operate your tool properly before starting a new project. One of the most common issues is using too much pressure when cutting with oscillating tool blades. Instead of trying to force the oscillating blade through the material quickly, take your time and let the teeth do the work. An oscillating tool can be used to cut a variety of different materials, but this all comes down to choosing the correct blade for the job. Something like a 1-3/8” Precision Wood Oscillating Blade is great for cutting wood, but you will damage the blade if you attempt to cut metal. To cut metal, go with something like a 1-3/8” Bi-Metal Plunge Cut Oscillating Blade, which can be good for cutting both non-ferrous metal and wood. Selecting the right blade for your oscillating tool is essential to successfully completing a project. Find the best blades for your oscillating tool at Rockwell! Oscillating tool correctly so the blades don’t wear, picking the right oscillating saw blade for the job, and keeping your oscillating multi-tool blades sharp. 10 Things you can do with an Oscillating Multi-Tool 6 Pro Tips for Using a Multi-Tool Must-Own Multi-Tool Accessories What Oscillating Blade Do You Need for Your Project?